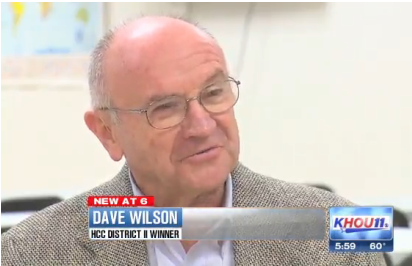 Houston Community College trustee Dave Wilson lives in the residence he claimed and can keep his seat on the college system’s board, a jury decided Thursday. “Thank you,” Wilson shouted when the verdict was announced about 4:30 p.m.
Harris County officials filed a lawsuit seeking to remove Wilson from office on grounds that he did not actually live in an apartment at 5600 W. 34th St. in the HCC district he represents. Because of this, county officials said, he was unqualified to hold his seat. A slew of exhibits by the defense showed that if Wilson doesn’t live in the warehouse, he’s gone to great lengths to make it look like he does. Wilson’s blood pressure medicine is mailed to 5600 W. 34th St. His bank statements and bills go to the warehouse. His numerous magazine subscriptions – from Forbes to National Geographic and Hemmings Motor News – go there, too. He’s also registered to vote there and lists the address on his driver’s license. The sticking point is that Wilson’s wife lives on Lake Lane. It’s also where Wilson’s children were raised, where Wilson says he spends his weekends and where the family gathers to celebrate holidays. Wilson also listed the home as his address on tax returns. Wilson says that’s because he wants the check sent to the house, so he can sign it over to his wife. I’ve said all along that if nothing else I hope we get some kind of standard out of this, because the residency laws as they stand now are ripe for gamesmanship. I don’t know if this definitively settles the matter, but it certainly sets an outer bound, which we could call the Wilson Line. Anything less egregious than what he did is apparently okay. Yesterday’s story, which focused on the county’s case, showed how Wilson tests boundaries better than any toddler or teenager you’ve ever known. Wilson lives exactly where he says he lives: in a “fully furnished” apartment in a warehouse on W. 34th Street, in District II of the HCC system, defense attorney Keith Gross told the jury. Just because his wife lives on Lake Lane does not mean it has to be his residence, Gross argued. Wilson has stated on voter registration cards, drivers licenses, tax and other forms that he has lived at four addresses since 2005, and those addresses all line up with some motive – whether that is to run for office, or take out a tax exemption – Ray told the jury. Wilson lived, and still does live, exactly where he claimed when he filed to run, his attorney said,adding his client spends “more than 70 percent” of his time on 34th Street. He has a driver’s license there, is registered to vote there and has all of his bank statements sent there. He’s lived there since early 2012. But since moving there, he’s also registered to vote at another address, on Claremont Street, where he never lived, so he could run for an open state Senate seat, Wilson testified during questioning. Wilson said he “intended” to live there, but he did not end up running. His defense attorney says “nowhere is it ever written” that you can’t live somewhere, if your motive is to run for political office. Wilson, an anti-gay activist, only wants to “improve the community” and has offended people in his quest to do so, Gross said. The case against him is politically motivated and that’s proven by the fact that more than 4,500 Harris County voters are registered at commercial buildings, as Wilson is, and the county isn’t going after any of them, Gross said. Basically, Wilson says he lives wherever he says he lives at the time, and that’s sufficient for the law. Nothing else matters – the homestead exemption on the house where his wife lives, the ever-changing nature of the address on his voter registration, the fact that some of his “residences” are not permitted as residential, etc. The law is vague and he’s hardly the first person to take advantage of that. He’s just the most blatant and least apologetic about it. And now a jury has accepted it. So be it, but that doesn’t mean I think it’s right. More to the point, I don’t think this is how it should be. As you know, I have an idea what I’d like to see the Legislature do about it. I plan to start my lobbying effort shortly. Amazing, the jury in this case agreed with Wilson on what the law says yet these folks were convicted and are actually facing jail time. They did it to expose a faulty RUD with no accountability, Wilson did it for reasons that benefit him. I guess the difference is if Abbott tries to make an example of you or not. Something needs to be fixed. Kuff, all the legislation in the world isn’t going to “fix” what they themselves don’t want to be “fixed”. I’ve lost count of how many people running for office inside an area would claim to live in either a family home, would rent, or list their business address rather than where they truly lived. Others, like a certain candidate for Lt Governor, would later buy a place in the senate district he ran for but when he announced, he most certainly did not live in the home beforehand. As backward and intolerant as Wilson is, he merely played the game just like many others have, even establishing a far more credible paper trail in fact. The difference is that he was not hand selected to run by the area power brokers so the county went after him. And lest it be said that the jurors were as smart as a box of rocks, note that voters have long been made aware of residency issues and it did not appear to make one bit of difference in their campaigns, the common understanding that even as dirty campaigning goes, it doesn’t work. Ultimately, if voters don’t care and jurors are going to bend over backwards as this jury did, why even bother? It’s not just GOP candidates doing it, though they seem to be in the majority. I think most of the candidates faking residency are Democrats who don’t want to really live in the racially segregated, low income districts which have been carved for them under the Voting Rights Act, but want the security of the voter support from those districts. Mainstream, I wish that were true but having known a wide array of these characters (on both sides of the coin), it just hasn’t worked that way locally in terms of sheer numbers.